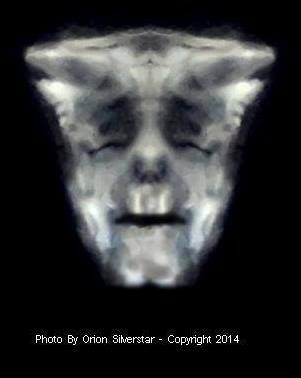 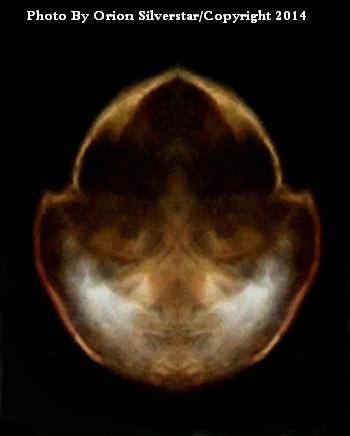 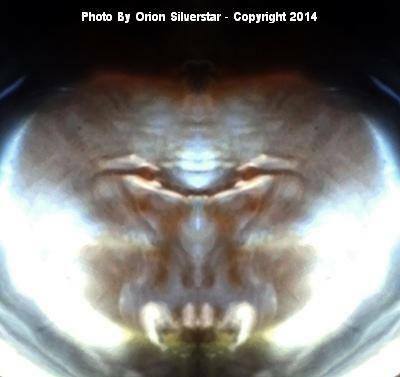 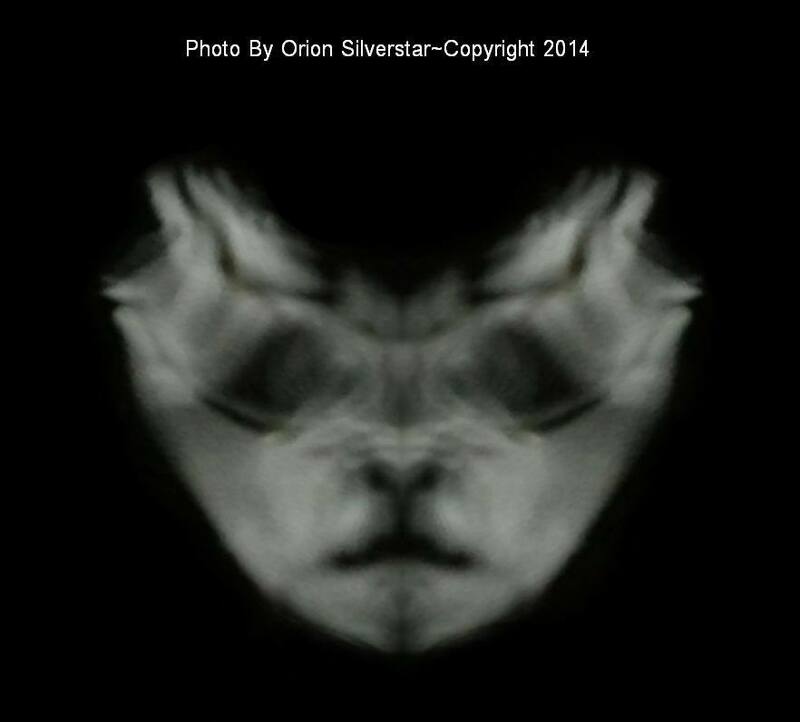 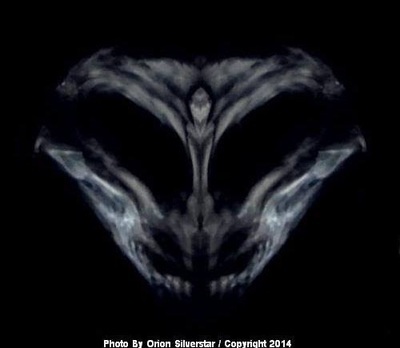 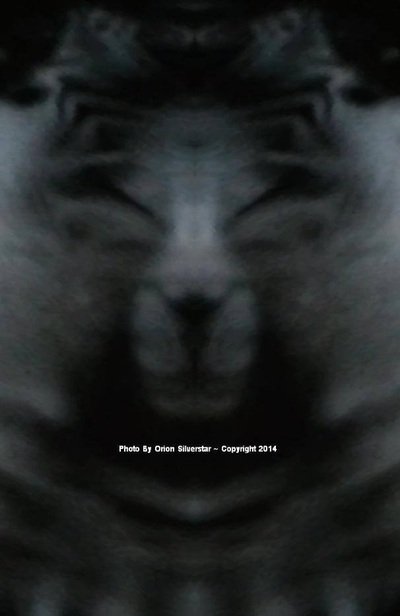 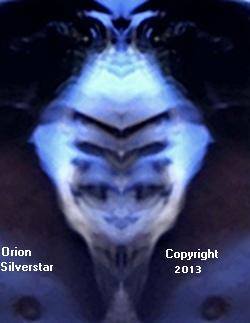 Over the many years now while working with the Moving Water/Light Reflection method of Instrumental Trans-Communication I have received many images from the communicators that have come through as half a face or a very distorted face. 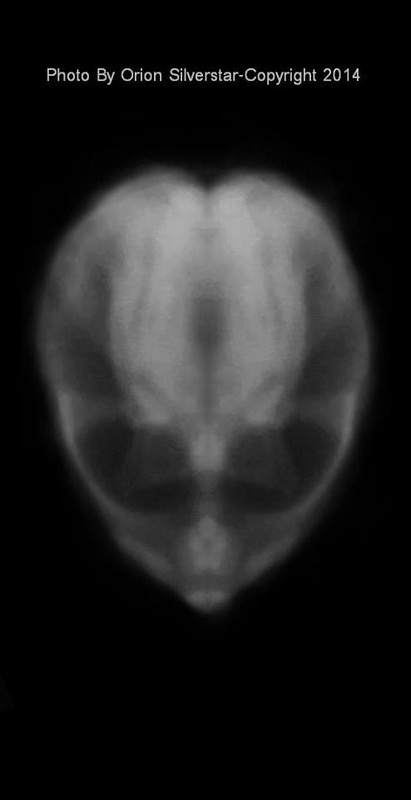 I have my reasons as to why this is, I believe also that I have a solution to this but in the meantime I do not have the funding to test my idea out. Sometime ago I was introduced to a software program that is a Symmetric program, for those that do not know much about Symmetry it is the mirror image of something. 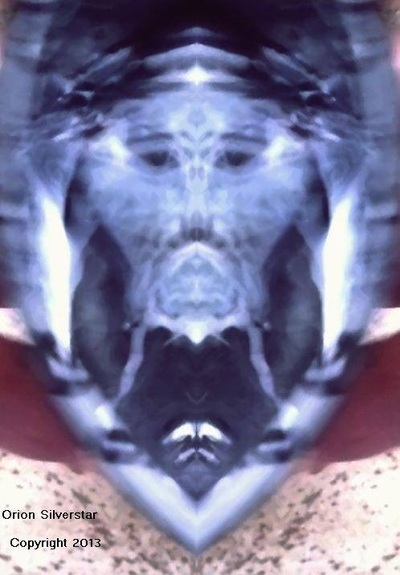 So with this Symmetry software I was now able to take these many half face`s that I had received and turn them into full face`s creating the same mirror image on the otherside. 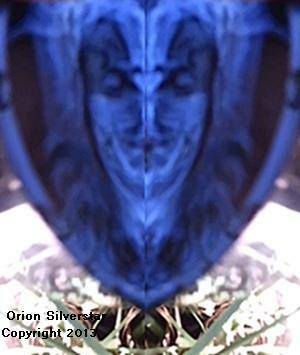 There has been many others that have used the Symmetric software before me to bring about mirror images with things like tree`s, plants and what ever you can think to use. 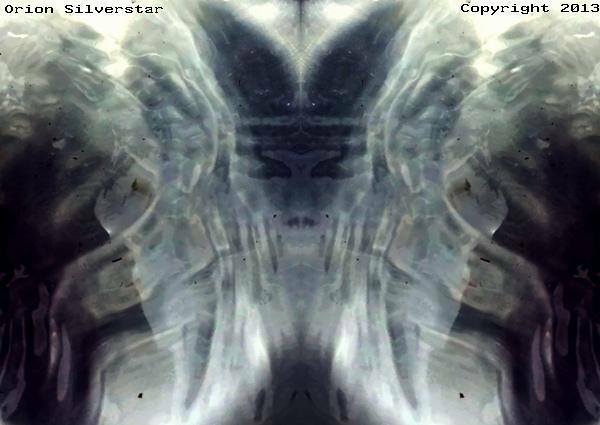 However I believe that I was the first to use this Symmetry software program combined with the Moving Water/Light Reflection method of Instrumental Trans-Communication with some very interesting results. 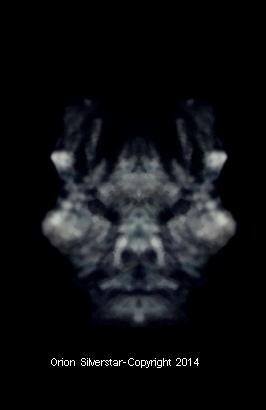 Through using the Symmetry software I came to realise that not all half faces that came through could be turned into full faces by a mirror image. 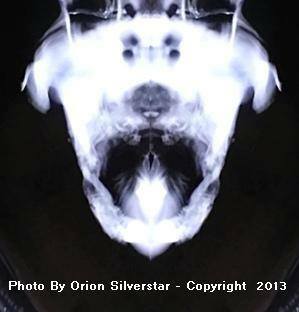 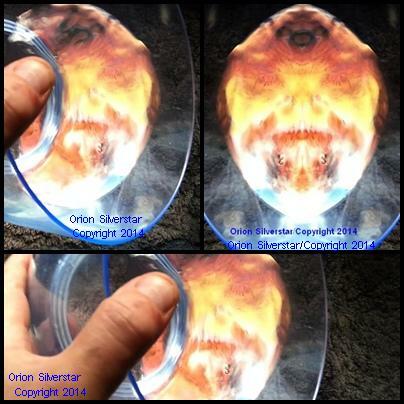 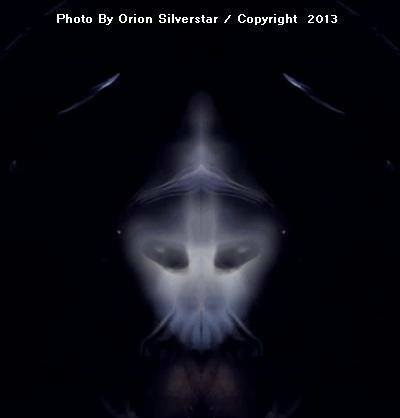 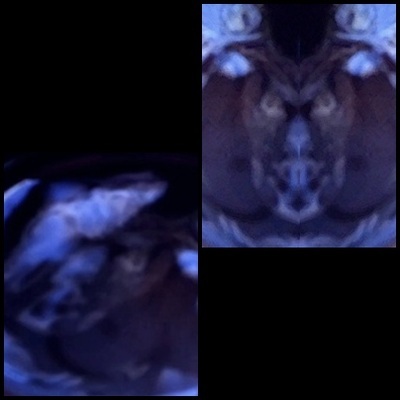 Some of the images and half face`s that had come through where on an angle or not looking directly straight ahead. If I was to use Symmetry software it would leave the face or image out of perspective to how it was meant to be, then giving an unrealistic image of how they are trying to show. 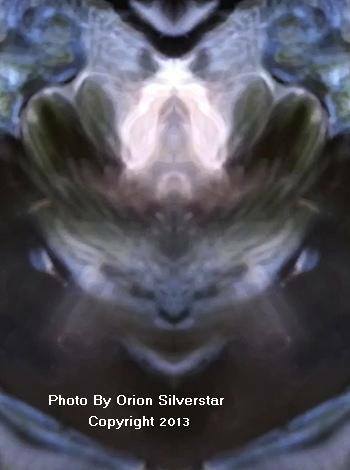 I had to be very careful as to not allow this to take place, often when posting my work in this area to the public I would post the original photo that came through along with the Symmetric version. 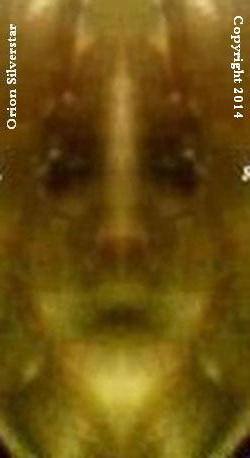 They the communicators often told me that it was not a fault on their count for the half faces and distorted faces that came through, but a problem at our end and that they where projecting a perfect image every time. 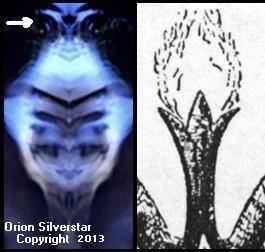 That it was not by chance or a random event but a deliberate act of communication to us on their part. 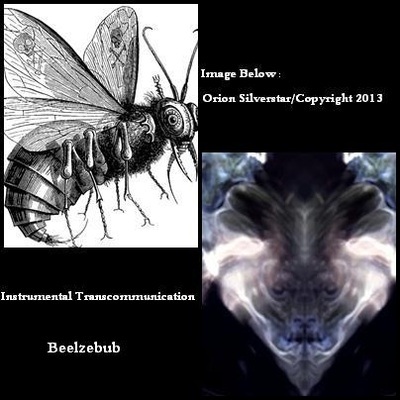 Here is two examples of an original image that came through in the Moving Water/Light Reflection method of Instrumental Trans-Communication and the Symmetric version. 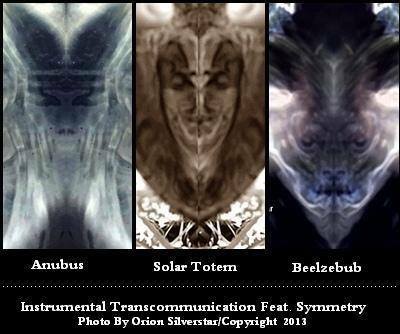 It is interesting on looking at these photo`s that the first one on the left looks a lot like a wooden totem and at the sides it looks a lot like solar rays projecting outwards. 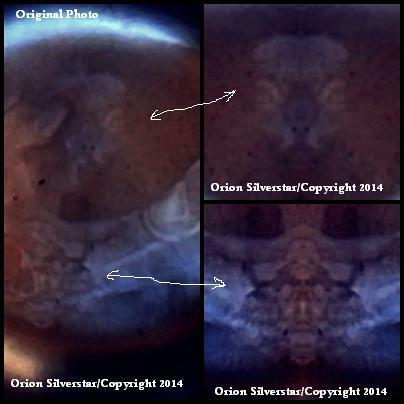 The second photo on the right is also interesting in that on having a closer look it shows a body out stretched, arms stretched out and legs stretched out. 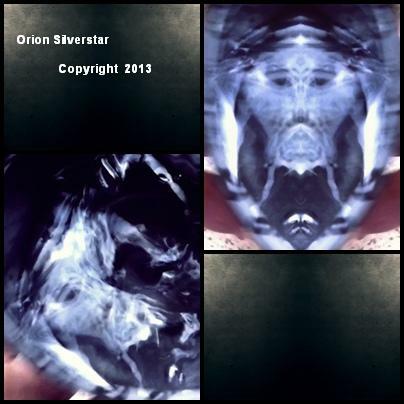 It reminds me of the third photo on the right "The Vitruvian Man" a famous drawing by Leonardo da Vinci made in 1940. 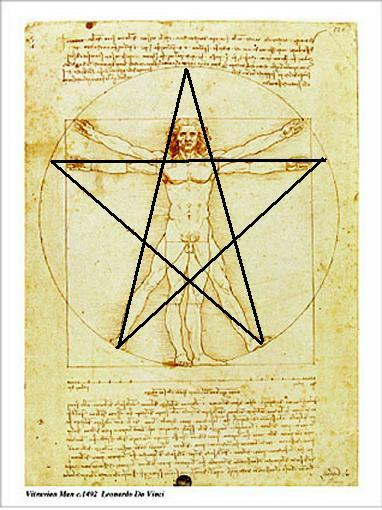 It maybe interesting to know that Leonardo`s drawing was reflecting the use of proportions and Symmetry of the human body as a symbol of perfection and harmony. 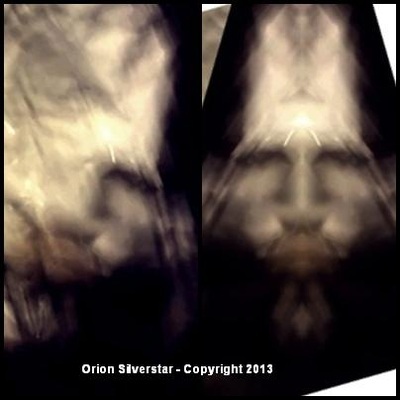 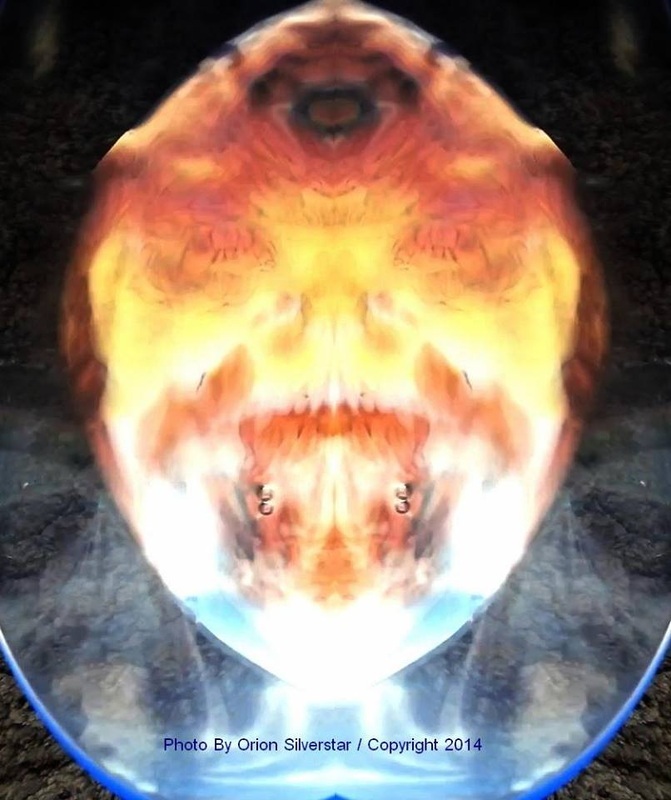 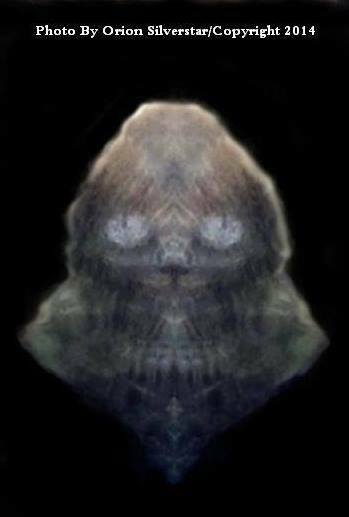 It represents a lot more than this but this is just a brief example and if you look at the Instrumental Trans-Communication photo, instead of a man it looks as if it is replaced by another being, but the over all full photo also seems to be that of a man with a long beard, his Third Eye/Pineal Gland is marked very clearly. 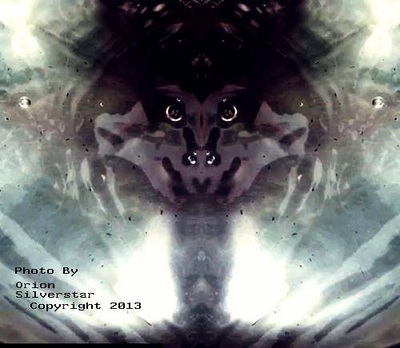 The symbolism here is not by chance, they are communicating to us a message through symbol and images, telling us a story through picture...it is upon us to take notice. 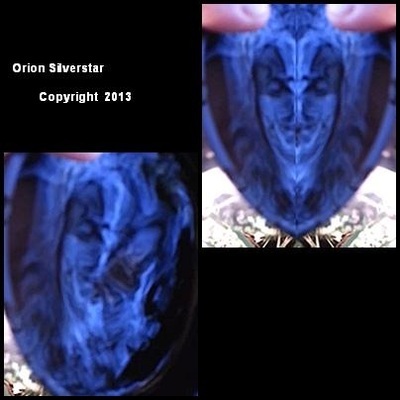 Here is some more photo examples of half faces that have come through using the Moving Water/Light Reflection method of Instrumental Trans-Communication and how using the Symmetry software I am able to create a full face. 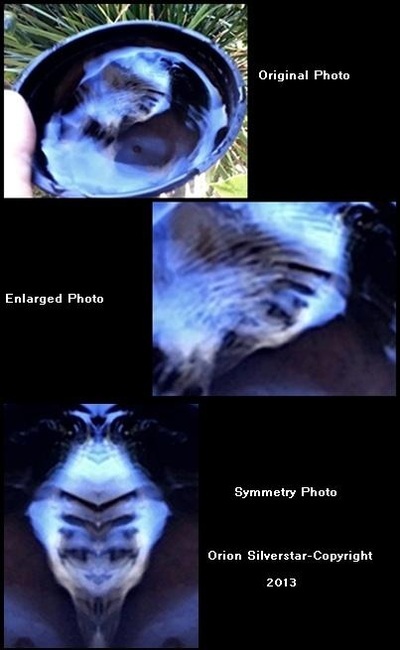 Here is some photo examples of the Moving Water/Light Reflection method of Instrumental Trans-Communication featuring Symmetry. 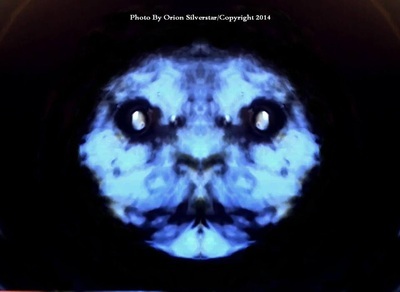 You will notice that there is a few images of cats and dogs here in the above Moving Water/Light Reflection method of Instrumental Trans-Communication featuring Symmetry photo`s, what is interesting to note is that when my own cats and dogs are around. 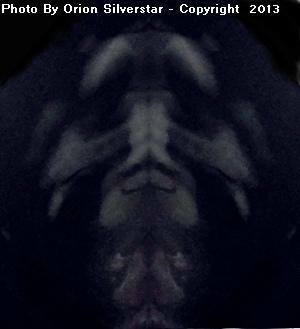 If it is my dogs that are around me then I may have an image of a dog come through, if it is my cats around me then I may have an image of a cat come through. 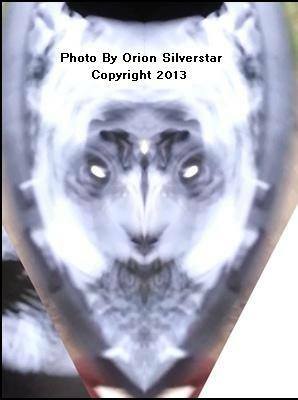 Before someone may ask is it the energy of my own animals that the water is picking up on, I would have to say no and rule this out as the images that come through are nothing like that of my own animals. 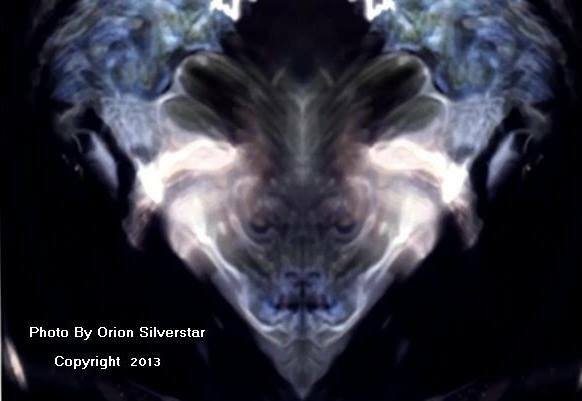 However I do believe that there is a connection between my animals and the images that show at the time they are around, at the times when my animals are not around I have many different types of animals show. 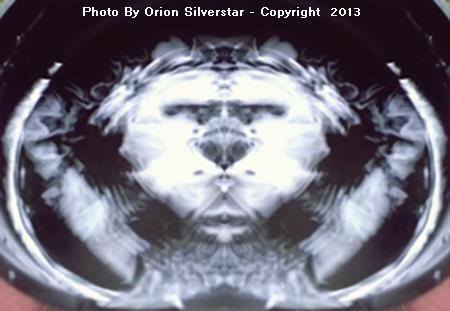 It is only when my animals are around do similar animals show, this has got me wondering do animals just like humans have animal guides and animal ancestor spirits watching over them just as we do.